So, remember back in November when I got in a wreck? Today is the day that I finally got to put my car in the shop to get it repaired. 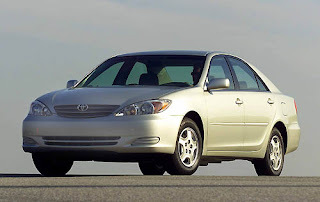 This is what I drive- a 2003 Toyota Camry. And no, that’s not me behind the wheel. That’s my bodyguard. I don’t trust him with my camera- just my car. And my life. So anyways, during school today I got on the phone to [unnamed car rental place] to secure a vehicle for the next few days. Fast forward to arriving at [unnamed car rental place]. And then THIS drives around the corner. 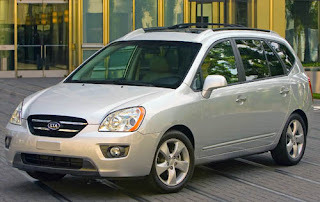 Uh, I’m sorry… but did my Mom’s minivan get pregnant and birth THIS? It’s a baby minivan! That’s not a car. That’s certainly not smaller than my Camry. I don’t even think it’s an SUV. Did someone think I said “Caravan” instead of “Camry”? Possibly. And I’ll be honest, this is a very flattering picture. You are very photogenic, Kia Rondo. Cause you ain’t that purdy in real life. And no, this babymini is not exactly in my price range. Nor my age bracket. So, I called the store and I’m trading babymini in tomorrow. But only after I go through a few carpool lines, stop by the grocery store for some apple juice boxes and gummy snacks, and load the kids up for their soccer games.